Leading security managers and educators lend their expertise to boost security and safety in the rapidly evolving energy industry. Are you in the energy industry, in charge of protecting your company assets from security threats and safety hazards? SecurityMatters Magazine partners with Ace And Associates, Inc. (AAA) to bring you the Energy Industries Security and Safety Symposium on 10 March 2017 at Hotel Jen Manila along Roxas Boulevard. The course is part of the Asset Protection Courses and Symposia, which gathers security educators and professionals for a comprehensive overview of the most pressing security issues today. The energy industry is among the most targeted sectors in the developing world, beset by both physical and cybersecurity threats. The industry’s facilities—power plants, grid lines, cables, and electric cooperatives—are all lucrative targets to criminals, especially extortionists. New challenges—such as the increased manifestation of the long-term effects of fossil-fuel power plants—are likewise getting the attention of environmentalists, while community support shifts to renewable energy facilities. These pressing issues will be the jump-off point for this symposium, which will gather security managers to share best practices—towards establishing a benchmark for industry safety and risk mitigation. Retired Vice Admiral Ferdinand Solis Golez is a decorated career naval professional who has held leadership positions and the management of major commands of the Navy—including his two-year tour of duty as the Philippine Navy’s Flag Officer in Command that concluded in 2010. Following his naval career, he joined the Energy Development Corporation, a global geothermal energy industry pioneer and the recognized world leader in wet steam field technology, as the Senior Manager for its Security Department. He is also a Director of Bases Conversion and Development Authority (BCDA) and BCDA Management Holdings, Inc. Concurrently he is the military consultant of the Vice President of the Philippines. Mr. Bingen Mendezona—currently the Vice President for Security of Aboitiz Equity Ventures, Inc. (AEV), the holding and investment company of the Aboitiz Group—is expected to share his experiences in providing security to the energy industry, including the challenges that he’s faced. Mr. Mendezona has been with AEV for more than twelve years. During his tenure, he developed both their executive protection program and their Physical Security program. Among his most notable contributions to AEV is the formalization of the company’s close protection segment with the Philippine National Police, which helped formulate the training standards adapted today for the Protective Agent licensure. Dr. Teofredo T. Esguerra will likewise be lending his expertise to attendees; he serves as the Disaster and Crisis Team Head of the Energy Development Corporation. With almost forty years of geothermal mastery, the EDC is continually diversifying its renewable energy portfolio through investments in solar, hydropower, and wind power projects in the Philippines. Dr. Esguerra himself is known to the general public as the “Everest Doctor”—he was the Expedition & Wilderness Emergency Medical Services Physician of the Philippine Mt. Everest Expedition Team and the Voyage of the Balangay. He is a Flight Surgeon and the Officer-in-Charge of the elite medical rescue team The Specialized Medical Assistance Response Team (SMART) of the Philippine Coast Guard. Capt. Carlos Ely C. Tingson is an Information Security Specialist / Technical Intelligence Officer of the Presidential Security Group, providing intelligence support as well as electronic countermeasures for protective operations for the President of the Republic of the Philippines. He also serves as the primary cybersecurity consultant to the National Security Council, reporting directly to the National Security Adviser. As a British Chevening Scholar, he attended the Royal Holloway University of London to take his masteral studies in Information Security, Cybersecurity Track. There, he conducted a study on the different challenges and response mechanisms of developing countries toward national cybersecurity development, with a concentration on Philippine government initiatives; he graduated with distinction. Mr. Neil M. Quijano serves as the Security Manager of STEAG State Power, Inc.—a leader in advanced coal power generation technology. It was established in 1995 as a special-purpose company created to own, finance, construct, operate, and maintain the first coal-fired power plant in Mindanao. SPI’s Mindanao Power Plant was established in 2006 in response to the Mindanao power crisis and has helped stabilize supply of electricity in the region; it is considered as the most modern in Mindanao. Mr. Augustus Caesar B. Esmeralda, the Managing Director and President of Ace And Associates, Inc., is expected to discuss the employment of a holistic approach in security-risk assessment in energy industries. His firm has both provided consultations and taken the lead on mining security operations for several high-profile companies and their projects—among them: the National Grid Corporation of the Philippines; the Monte Oro Grid and Resources Corporation; the Palm Concepcion Power Corporation; the GNPower Plant in Kauswagan, Lanao del Norte; the Ozamiz Coal-Forest Power Plant in Misamis Occidental; and the North Luzon Renewable Energy Corporation. Mr. Esmeralda, in his own right, is backed by decades of achievements in the security sector and related fields: From his combat service in the Armed Forces, to his considerable accomplishments in the private sector, which include his being the security lead for DHL Worldwide as Country Security Manager for the Philippines; and as Regional Security Director of Shangri-La Hotels and Resorts, during which he covered nine countries and 37 properties. 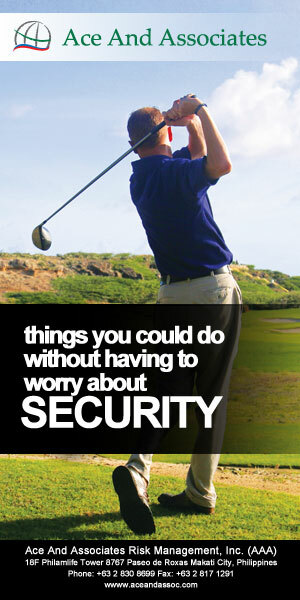 How much do security and safety matter to you? Through the Asset Protection Courses and Symposia, we’re raising awareness about the best practices for security and safety—from the industry-wide, to the corporate, to the personal. Register online!